Bolt on bracket upgrade for the following chassis: 2008 and up Ford E-350 and Ford E-450 chassis cab motor homes class-A/B/C Order this kit in conjunction with your Platinum, Wireless or weld-on Automatic systems to convert to a zero welding... QE3/Square Leg Weld-On Bracket This is the weld-on mounting bracket for all QE3 (24k-lb) cylinders AND for all Square Leg 4 Point Systems. 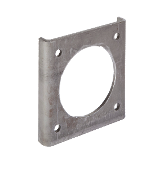 This deep long bracket is one of our strongest brackets due to the increased lateral strength from its depth, long design allows for the cylinder to be mounted lower or give it increased backing strength for the large applications. This bracket fits all 8k, QEI & QEII cylinders. This weld-on mounting bracket's unique design mounts to the inside of most frame rails. Most of the time this bracket is used in the rear of Ford Class C/B motorhomes. For use with all 8k & QEI cylinders. Weld-on mounting bracket for all 8k, QEI & QEII cylinders. This low profile bracket helps with tight clearances from the frame to a storage box or tank, also long design allows for cylinder to be mounted lower on the frame for increased lift.... Weld-on Bracket for mounting round leg jacks to your coach. This bracket is usually found on the front of Ford Class C/B motorhomes & the rear of 5th Wheels. But this bracket accommodates for many applications. For use with all 8k, QEI & QEII cylinders. This is our standard bracket, simple 7x7 size that is low profile for those tight spaces between the frame and a storage box or tank. This bracket fits all 8k & QEI cylinders.